“More and more visitors act as tourists rather than as ecotourists and eventually destroy what they came to see” (Russon, Susilo and Russell 2004)… How about we change that? To protect our Great Apes family! Primate tourism has exploded in recent years, and with it, the challenge of keeping this form of tourism from impacting wildlife negatively has deepened. Respecting the habitat and the welfare of the wildlife is the number one ethical rule for anyone enjoying the activity of wildlife watching or photography. It is easy to get caught up in a moment of excitement or ignorance and forget to behave mindfully. Here, we are presenting further details, considerations, and requirements for when you go to see any of our siblings: Chimps (including the smaller Bonobos), Gorillas and Orangutans. Keep in mind that general EwA Wildness Etiquette also applies when ‘Aping’. All great apes are endangered. Actually, this is not quite true... If you search directly for ‘Great Apes’ in the IUCN Red List species assessment database, then what you get back is not 6 species (as most expect), but 7. Six of them are endangered, 4 of which being classified as Critically Endangered –the highest risk category assigned by the IUCN Red List for wild species. All of the 6 endangered species continue to see their population decreasing. The 7th is on the contrary rapidly increasing and classified ‘Least Concern’: Homo Sapiens. All great apes (other than us) are indeed endangered. The population numbers and their decline over the last century are staggering. It is not the time to feel desperate, instead we have to work harder, raise awareness, and take action to protect them in their natural habitat. Letting them disappear is absolutely not an option for them and us. Knowing is Caring: Learn before you go. Visit our hominid cousins well prepared so as to minimize your impact, and maximize safety for anyone (them included) as well as for the enjoyment of everyone. Enjoy! No wandering on your own. Stay with your group. Beware that large human groups are threatening to them. ▸ We should not crowd them. This means understanding what is the optimal visitors’ group size for the species we are observing. It is generally advisable to be less than 6-8 people total. Experts recommend the number of visitors to not exceed 6 for Eastern gorillas, 3 for Western gorillas, 6 for chimpanzees, and 5 for orangutans [ME10]. ▸ Always stay as a group. As visitors, it is important to stay together in a close group so that they can gauge you at a respectful distance. Having a dispersed crowd of humans around is stressful and certainly for the apes in charge whose job is to defend the group or its infant. You would not want to be surrounded by a group of strangers –the same applies to them. Remaining together is also a safety matter for us. For instance, chimp groups are less cohesive than gorilla groups, and under no circumstance should a visitor be separated from his group in the vicinity of displaying adult males who are up to 5 times stronger than an average man. ▸ Speaking of chimps: No visitor younger than 15yo should be allowed in their presence. 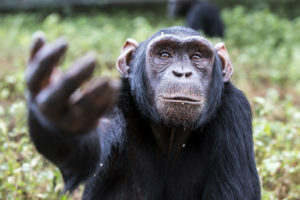 Chimps are known to have attacked young humans. No need to over-react, they are not thugs either. We are actually more dangerous than they are, so just remain calm, respect proper ape etiquette and follow the instructions of your guide. Disease transmission is real and can kill them. Take it seriously and make sure you’re healthy prior to your visit. The fact that great apes are genetically close to us, brings a whole set of health rules specifically geared at protecting us and them who are not immune to our germs. ▸ A must: People who feel sick should not go trekking or generally approach any great ape of any kind. Why? They are susceptible to get sick with our human parasites and germs. It is devastating to see how many humans don’t know this and too often indulge in getting as close as possible out of ‘love’. ▸ Don’t spit. Don’t cough and if you do, get first at a greater distance (> 20 meters / 60 feet) and contain your cough in your elbow (not the hand as we will touch trees, grass and therefore potentially increase contamination of the area). 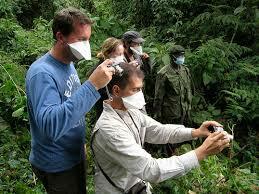 ▸ Many research groups now wear face masks to avoid transmitting airborne diseases. Consider doing the same. How about bringing one anyway: they cost nothing, weigh nothing, and can save lives. (Check EwA’s Wild Tip: Wearing a Face Mask when Visiting Great Apes). Research often focuses on infectious diseases animals have given to humans (i.e., zoonotic diseases). However, an increasing number of reports indicate that humans are transmitting pathogens to animals. These are called reversed zoonoses or anthroponotic diseases. 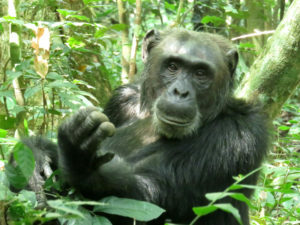 Because of habitat loss, and increased form of wildlife viewing and tourism, reversed zoonoses can be devastating when it concerns our genetic siblings that the great apes are. In a bid to save wild apes from extinction, people may be unwittingly infecting them with potentially deadly diseases, new research shows. Humans and great apes are closely related, creating the potential for diseases to jump between them. Please go to the bathroom before you set out. And where possible, visitors should try and wait until they are out of the forest. ▸ Do not defecate close by. Take care of any needs before leaving the base camp. Transmission of parasites, as many gastrointestinal parasites are passed through feces. For instance, chimps in tourism areas have higher numbers of E. coli (a gastrointestinal parasite) than chimps living near villages [GT07]. In short, our poop is simply unhealthy for them. Our poop hosts pathogens (bacterial, viral, fungal, parasites) that may be harmless to us but can be harmful to them. Again, incidences of troops decimated by epidemics are not uncommon [KS08]. ▸ If you must relieve yourself, then wait and do so at a great distance from their site (ask your guide). Dig at least 2 feet down and bury it. Great apes visits are usually limited to an hour. Those group visit duration rules are very important so as to reduce animals’ exposure to potential germ-carrying people minimize behavioral disturbance and associated stress in the animals. Even when these rules are not acknowledged or enforced by the local tour operators it should be our responsibility as tourists to raise awareness about why this is necessary and promotes adhesion to these rules. Don’t get close. Know and respect the viewing regulations. Healthy visitors should be no closer than 10 meters (33 feet) from an orangutan or a chimpanzee, 7 meters (23 feet) from a habituated gorilla. This is no joke and it is for their sake and health. Again we are too close genetically and they are not equipped to handle well our parasites and germs (many of which we don’t even know we carry since they are harmless to us). ▸ Respect the regulations in place or our distance approach recommendations if none are enforced locally. It is important to understand that these are minimal and not optimal regulations. ▸ Move at a leisurely pace: no sudden movement. Never run! Again if there is an aggressive display or a precarious situation, listen to your guide and comply promptly with his/her instructions. Do not feed them. Do not give them a drink. Do not eat in their presence. Do not leave your bag unattended. Some over habituated apes are going to go for your bag.Do not respond to beggar apes either. As ethical visitors we have to understand that indulging in feeding them, we endanger their own survival and the survival of their infants. In short, our food is harmful because of health risk and habituation. 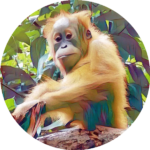 Check our Field Notes, which showcase the issue of over habituation for some of the orangutans we encountered in Sumatra. The Red Apes of Bukit: Is Orangutan Tourism Ethical? Reduce your equipment sound levels to a minimum. Keep quiet, don’t imitate them or try to communicate with them. [Chimps] ▸ No grunting, hooting, panting, lip-smacking, whimpering, laughing, barking, screaming… They have a strict communication protocol (and some are aggressive communication mechanisms). Human smiling teeth have very good connotations signifying happiness. 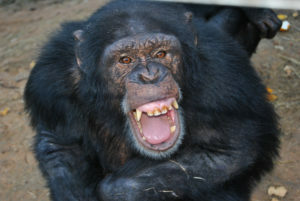 However, in chimps, showing teeth can have very bad connotations such as fear or aggression. Be careful not to show your teeth too much when in close proximity to the apes. We should respect them, and their culture and remember that it takes years of work to become as good as Jane Goodall in chimp language. [Gorillas] ▸ No chest beating, grunting… If some of the chest beating activity is a group keep-in-contact tool for gorillas, some others are pure aggressive displays. In which case, it’s meant to assert authority and scare the opponent. So doing so, we’ll only get the males angry, and the chief in command in rage (the silverback). Yes infants do it and it’s cute, but they’re only practicing. As for us: there is no escaping this rule. We should be simply respectful of their culture, and be mindful so as to not wreak havoc with their group/family. [Orangutans] ▸ No kiss squeaking or grumphing, bellowing or long calling… As with our other siblings, it is critical to keep quiet in the vicinity of orangutans. Instead, recognize few of their vocalizations such as the kiss squeak that can be a sign of curiosity, but more often a sound made when they are disturbed. Move further when you hear those sounds. Those sounds are also deterrent for them, and less dominant individuals will leave if they hear a kiss squeak. Make sure that you understand the essentials of how they communicate so that you can be mindful and be responsive when they warn us that we are too close, too loud, etc. Practice looking from the corner of your eye: generally making eye contact is extremely threatening to many primate species. A humble body language is key: No putting up our hands or arms. No pointing. ▸ Staring is a no go: only our species stares at another with such intensity, but for most starring is a direct act of aggression. Following the same logic and understanding that a lens more less looks like a big eye, then accept that a lens can be perceived as a threat. ▸ So don’t stare or use camera/videos when they are disturbed. For instance, if an orangutan kiss squeaks and drop branches you know you have to stop right there and move back. ▸ As for your camera or video recorder: Do not use flash or use reflective devices, it is a stress factor for them. Wild animals are unpredictable when startled. Visitors have been seriously threatened by chimpanzees after ignoring this rule. Never try to attract an animal’s attention in order to take a better photograph. Besides flash is of no use in a forest. At night? No flash either, or rather use red light. Follow the guide rules, and challenge respectfully the guide if himself uses white light. If an ape comes within the approach distance, your guide should have you move away slowly, serenely, quietly. ▸ If an ape comes too close and you can’t move away, then remain calm and do not touch him/her. Again do not stare and remain humble. Keep low if you are among gorillas (i.e., where possible sit or bend when watching them). 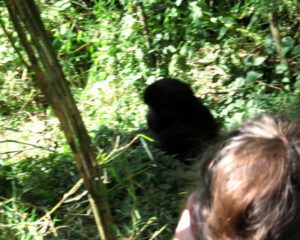 ▸ Keep your bag and other items in safer places where young gorillas cannot approach to investigate. If they take your bag, do not hold on to it or fight back. Your guide may be able to retrieve it later. Only bring the essentials into the forest: your and their health and safety is more important than anything. ▸ Don’t take anything such as plant material, rocks. Don’t cut vegetation to have a better view. If you cannot get a good view, tell your guide and he will try to put you at a better point. ▸ Don’t leave anything behind: food, whatever, no nothing. Why? Again our trash is harmful because of health risk and habituation as explained in the previous rules. Check our Field Notes, which also showcase an example of over habituation of some Sumatran orangutans. ▸ When you witness ‘code-breaking’ by either visitors, guides or experts, don’t remain silent. Assess the situation and if safe then ask why they’re behaving the way they do. Discuss the known consequences. Those consequences can be lethal for our ape friends. The problem with our silence is that the issue is then deepening, and possibly impacting that ape directly. ▸ The best is to come prepared and discuss the rules with your party and the guide before getting on the site. ▸ In all cases, discuss respectfully with uninformed tourists, guides or experts. And if you feel you can’t (that is, if you feel unsafe or threatened), then report immediately to higher authorities as soon as you’re back to safety. If you are planning to go and visit great apes anywhere they remain, please take the time to also check our general EwA Wildness Etiquette. Help their protection and conservation where they were meant to live and thrive. Thanks! 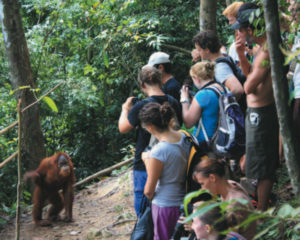 [DD14] The Impact of Tourism on the Behavior of Rehabilitated Orangutans (Pongo abelii ) in Bukit Lawang, North Sumatra, Indonesia by Dellatore, D.F. & al. (2014). In Primate Tourism: A Tool for Conservation? by Russon, A. & al. (2014). [KT08] Descriptive Epidemiology of Fatal Respiratory Outbreaks and Detection of a Human-related Metapneumovirus in Wild Chimpanzees (Pan troglodytes) at Mahale Mountains National Park, Western Tanzania by Kaur, T. & al. (2008). Am J Primatol 70: 755–765.